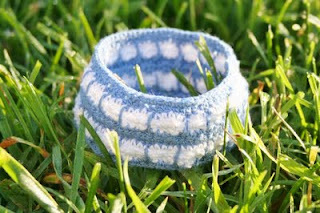 The Purl Bee is a wonderful site full of beautiful projects and tutorials. I have made more than one thing using patterns/tutorials from the site. 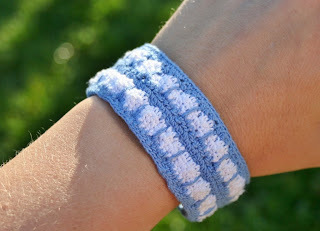 While looking for crocheted "things" I found Wren Handmade: Crocheted Bracelets . I was sold and decided to make one for my little girl. I worked on the pattern on my lunch hour and quickly decided that since I am still a beginner crocheter and my daughter does not like jewelery, that this would not be for her. A little too much work. I am not one to give up easily, so I chose to go ahead and complete it. I messed up the pattern! I did one stitch wrong (each time it was in the pattern), plus I lost count a couple times and by the end I had to do whatever stitches worked because the ones in the row before were wrong (Oops). I finished it yesterday and at first I was not sure how much I liked it. Overall I was happy, it looked close to the inspiration bracelets. By the end of the evening I absolutely loved it! I wore it out last night to my youngest boy's soccer game. I wore it while I wrestled with my unhappy little girl. I wore it all evening. It is so comfortable and so child friendly. I, like my daughter, don't love jewelery, but this is more than jewelery, it is a wonderful, comfortable accessory. I will wear it again and I will try the pattern again. Hopefully I will get it right next time!